Once you see one, you’ll spot ’em everywhere! 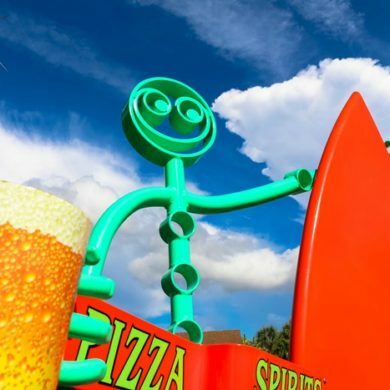 These colorful metal men can be found across Sarasota … and around the world. The Tube Dude himself, Scott Gerber, can design whatever you seek. His popular ‘tube dudes’ are all around town – holding mailboxes, signs and tables, drinking, playing sports or just hanging out, making them a big part of our neighborhood story. Whatever they’re doing, they all look so happy. And they’re designed to make you happy, too. Back in 2008, Scott was working for a yacht builder, until the company took a hit. Needless to say, it was a bad time to build expensive boats – and a dark day for Scott. He needed something to lift his spirits, so he made the first tube dude. He wanted something to hold his fishing pole … and somewhere to put his water bottle. He placed the dude on his dock on the first of July. July 4 came around, and the metal man was still hanging out there. Then, they began fishing for their own tube dudes. The lady next door asked for a tube dude to hold her mailbox. Frankly, Scott thought it was kind of dumb, but he built one for her anyway, because he didn’t have a gift for her on her birthday. She asked what he was going to do for a living now that he couldn’t build boats because no one was buying them. “Why not these?” she replied. He figured no one would buy them … until she handed him 11 notes within two weeks that she found in her mailbox asking where she got him. During the recession, everyone else was pretty bad off too, and Scott was feeling bad about it. Then, he sat in his car on the side of the road and read The Secret by Rhonda Byrne for about a week and a half. It was a form of therapy that made him feel better. He started putting up tube dudes when no one was looking. One Sunday shortly thereafter, Scott made the front page news, and his phone started ringing off the hook. Everyone wanted a tube dude. Only around 10 percent of the 4,000 tube dudes made are still in Florida. They live all over the world! Even though he’s been voted the most popular artist in Sarasota, Scott stays humble. After all, it’s not about the ‘Tube Dude’ … it’s about the tube dudes. The Tube Dude Shop is located at 1818 Main Street in Sarasota FL. For more information, visit the Tube Dude website or call (941) 735-6009.